Test utility rapidly and easy. SoftEmpire catalog is cheerful to show a handy diversity of the most good free software, utilities, and solutions. On this directory you may download demo versions of hot paid programs, and recieve the greatest free programs for your computer or cell device. Investigate an ultimate collection of exclusive new programs on SoftEmpire! Download demo versions and get new apps on your computer or cellular gadget. Have a look on the recent editions and updates of typical tool, fresh programs, and computer programs! Setup for free! Computer utility software downloads. The excellent programs for Windows, Linux, and Mac! System software for professionals, dummies, and all in - between. Hard drives utility diagnostic tools to try the physical media. Utility software for Linux: free downloads for the free operating system! Find anything useful now! Company: Advanced Interactive Marketing Inc.
System BodyGuard is a complete computer security program 100% FREE. As powerfull as many paid programs with more features! 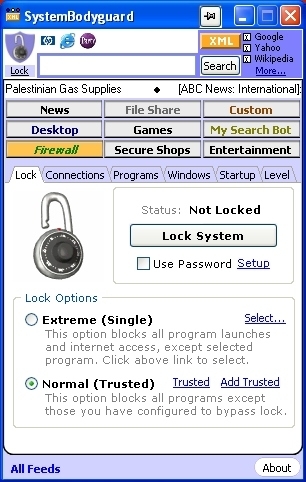 One click FireWall to stop all threats as well as lock computer from use! Stop people from looking on your computer.